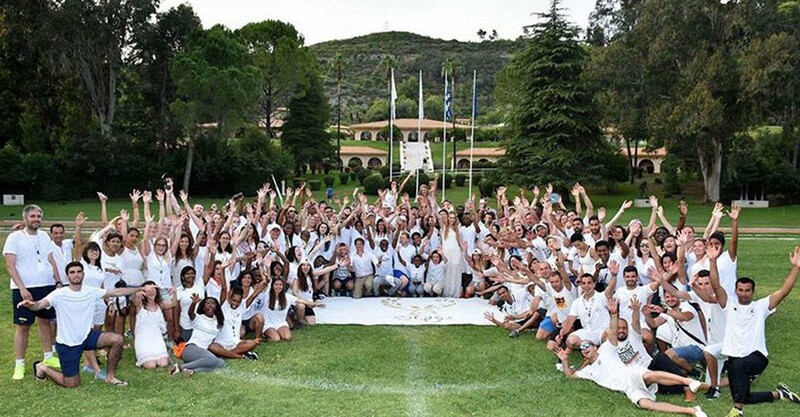 The International Olympic Academy was inaugurated on June 14, 1961, and Cleanthis Palaiologos, Director of the Physical Education Department of the University of Athens, and German Professor Lotz, led the work of the first session. Today, many events are taking place at the premises of Ancient Olympia. DOA operates in the marvelous facilities owned by the Hellenic Olympic Committee, located a few hundred meters from the Holy Cross in Ancient Olympia. The facilities are built on a verdant and hilly area of approximately 900 acres. The geographic allocation of the IOA is decisive for its ideological identity, which is also determined by the extra choice of the same space, as the place where the heart of Pierre de Coubertin is kept in a special memorial column. -Sadrial Center (1800 m2), consisting of the modern and fully equipped amphitheater “Dimitrios Vikelas” 450 seats with the possibility of simultaneous translation in 8 languages, two classrooms of 20 seatseach and a library with studios, fully equipped on Olympic and sports interests (with more than 20,000 book titles). -Sport facilities with a football field, athletics track (250m), 2 basket ball courts, 2 tennis courts and a swimming pool (25m). -Additional facilities are the 110-seat “Otto Szymiczek” conference center – the ATHENS 2004 Historical Archive, a manage men twing, 254-roomed rooms, 18 single (ensuite), 62 twin (ensuite), 14 dormitories of 8 (withbathroom), restaurant and cafeteria, wireless internet connection is available throughout the premises. The outdoor are a also functions as an open sculpture museum.